Enterprise Storage Stack (ESS) is the only commercially available software solution which lets you build Enterprise class mass storage with Commercial grade SSDs. We achieve this cost-saving goal by reducing the wear-amplification associated with SSDs, as well as reducing data amplification associated with Raid-structures and file systems. FTL Wear Reduction. ESS writes clusters of random writes, together with their metadata, in a perfect linear stream. ESS also supports trim and virtualized empty blocks, creating free space to optimize performance and wear. Commercial grade SSDs normally have a wear amplification ranging between 8:1 and 13:1 depending upon free space, the same drives run with ESS typically experience wear amplification of only 1.3:1, due to their patented, unique methods of consolidating change and amplifying free space. Raid Wear Reduction. ESS writes perfect Raid-5 or Raid-6 stripes as a complete chunk. This causes Raid-5 arrays to last nearly twice as long, and Raid-6 array to last nearly three times as long. Compression Wear Reduction. Compression, like virtualization, reduces the number of writes, and the amount of space needed to store data. ESS compression is very efficient and not only lets you store more, it also wears the drives less. ESS is particularily good at reducing wear created by file system control blocks and journals, which are highly compressible. Comparing Results: ESS literally makes flash last longer, much longer. When looking at the complete stack, we see a 6x-10x improvement versus a stock consumer SSD FTL, 2x-3x for RAID, and up to 3x for file system induced writes. In the end, a consumer SSD can last up to 30-45 times as long as the same SSD, in the same array, with the same workload using standard Linux disk management utilities. Lower Build Cost, Extend Life, or Both: ESS lets you use fewer, less expensive SSDs while maintaining life. 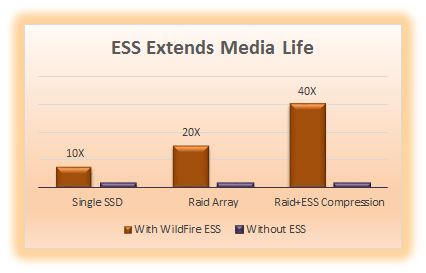 How long your array will last still depends on your workload and the array size, but ESS gives you longer life from lower endurance media.